When you're passionate about graphs like I am, you start to see them everywhere. And as we are getting closer to the food-heavy season of the year, it's perhaps no coincidence that this graph I will be introducing in this blogpost - is about food. A couple of weeks ago, when I woke up early (!) Sunday morning to get "pistolets" and croissants for my family from our local bakery, I immediately took notice when I saw a graph behind the bakery counter. It was a "foodpairing" graph, sponsored by the people of Puratos - a wholesale provider of bakery products, grains, etc. So I get home and start googling, and before you know it I find some terribly interesting research by Yong-Yeol (YY) Ahn, featured in a Wired article, and in Scientific American, and in Nature. This researcher had done some fascinating work in understanding al 57k recipes from Epicurious, Allrecipes and Menupan, their composing ingredients and ingredient categories, their origin and - perhaps most fascinating of all - their chemical compounds. 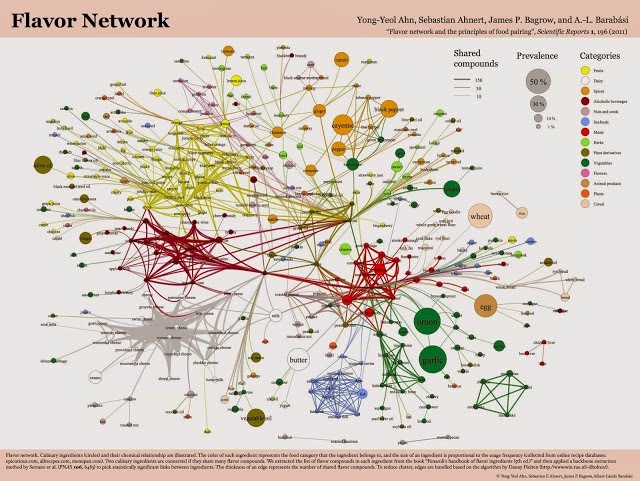 And best of all: he made his datasets (this one and this one) available, so that I could spend some time trying to get it into neo4j and take it for a spin. So what do you do - especially when you're not a programmer like myself? Indeed, MS Excel to the rescue! It turned out to be a bit of manual work, but in the end I found it very easy to create the sheet that I needed. 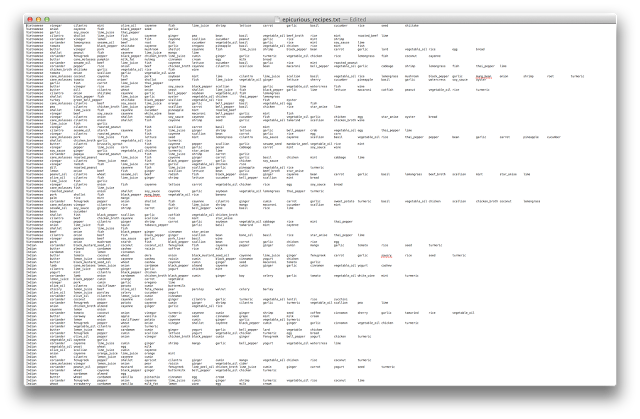 It was even less than 500k rows long in the end - so Excel didn't really blink. You can find the final excel file that I created over here. Then it was really just a matter of exporting excel to CSV files, and getting it ready for import into neo4j with neo4j-shell-tools. Again: easy enough - I sort of went through this a couple of times before. 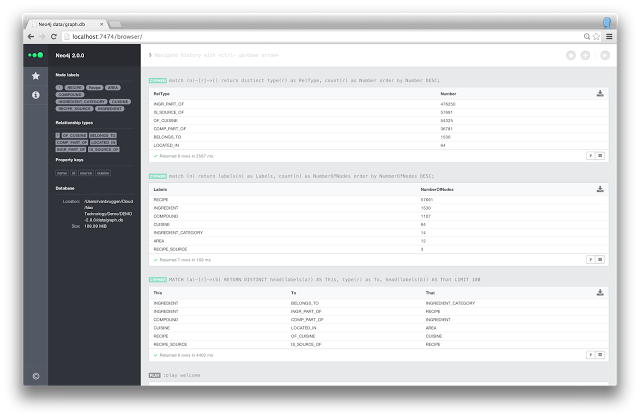 You can find the zip file with all the csv files over here, and the neo4j-shell instructions are in this gist. As you can see from the screenshot below, the dataset was well imported, without any issues, in a matter of minutes. So then, the fun could begin! 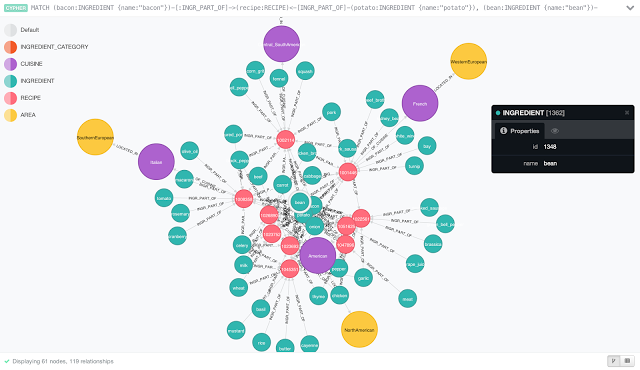 Interactive exploration, in the awesome neo4j browser. I have put all of the queries that I wrote on this gist over here - but I am sure you can come up with some more interesting ones. Clearly North America is leading the charts up here, but it's kind of interesting to compare the different continents/areas and compare what types of ingredient-categories are leading there. download the zipped graph.db directory from over here. pay a visit to our friends at Graphenedb.com, who have an extremely nice sandbox environment that you can play around with. Handle with care, of course! If you do, you may also want to apply this grass-file so that you don't have to mess around with the default settings. a Merry Christmas, and a Happy New Year! What a blog it is. This is giving me very important information so thanks a lot for posting. Pleasure! Hope you have fun with this - and happy holidays! Can i use this data for commercial usse? I think so - although it's really old by now and I doubt that there are really interesting commercial uses. What are you thinking about? 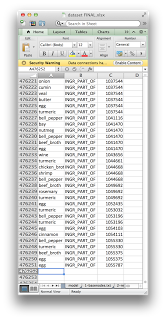 Stephane, all the queries are in the gist that is mentioned in the post: https://gist.github.com/rvanbruggen/8007697#file-foodqueries-cql ... Does that not work?? ?